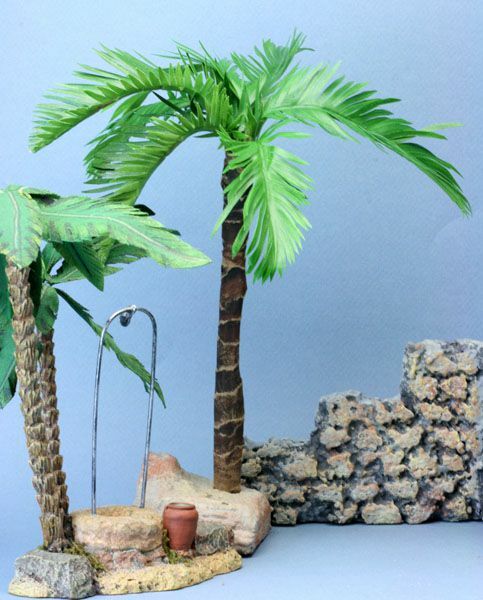 Lots of miniature and scale model scenes could use a simple stone wall or a stone finish on a simple building. These instructions show you how to use various supports and model all kinds and colors of stone walls from dense insulation foams, florist's foam or styrofoam beadboard, and various protective and paintable coatings. The durability of the piece will depend on the coating you protect the foam with, as well as how much handling the piece must endure. Although foam can easily be made into stone for walls, model horse jumps or buildings, or left to free fall down mountain terrains in railroad scenes; you may prefer more structured modeled stones from plaster, clay or paper clay. Instructions for using modeling materials to make stone finishes are given in this tutorial using paper clay to make a faux stone foundation for a porch on a rustic cottage. Here you can find a range of options for creating walls and stone buildings different materials. The carving and coating methods will work regardless of whether you want a single stone wall for a model horse jump, a few stone walls for a Christmas village, building fronts for a nativity scene, blasted stone buildings for gaming terrains or scree slopes for a model railroad display. The strength of a terrain depends on the backing, the modeling material applied to the backing and the coating used to protect the modeling material. If pieces are handled a lot, use dense insulation foams glued to thin wood backings, or use the air dry clay or paper clay method of creating a stone effect on Gatorfoam or wood. If pieces are viewed, but not handled, you can use weaker foams, like styrofoam beadboard (sheet styrofoam packing materials) or dry florist's foam, applied to backings if the pieces are larger or need to be supported for other purposes (tunnels, caves, etc.) If pieces need to be moved and stored for occasional use and don't receive a lot of wear (village displays) you can use the easiest obtainable foam, with an appropriate coating. Insulation foam is the strongest and easiest to work with if you live in a cold climate where it is used for home insulation. There is little strength difference between brands; your choice should depend on the board thickness you need, and the availability and cost. Dry Florist's Foam is easily obtained from florist's or craft shops and can be carved like butter. Sold mainly in brick shapes, is very brittle and crushes easily. If covered with a strong protective layer, it is still suitable for village building walls (applied to a wood or heavy card understructure) or for stand-alone pieces that won't be handled a lot. Encasing it entirely in the strong coating will make it more resistant to damage. Styrofoam Beadboard is a commonly available packing material also sold in sheets in craft stores. It is very weak, breaking easily, and can be harder to use for fine details due to the bead shapes it is composed of. It is inexpensive and easy to find, and a heavy protective coating will make it stand up to reasonable use. Rosco Foamcoat used for coating stage props made from foam, which is similar to a thick, flexible gesso and is available from theater and photography suppliers. Artist's Gesso - a thick coating which acts as a primer that can be tinted or sanded, and which forms a strong base for acrylic paints. Non-Sanded Tile Grout, which can be mixed with the addition of an acrylic binder or Weldbond glue (one part glue to one part water added to the dry mix) to make the grout more flexible, with a slower setting time. Grout can be colored, sanded and painted and makes a very strong surface over weak foams. Its disadvantage is that it sets up quickly and once set needs strong carving or sanding tools to adjust it. Shaping rigid foams into faux stone walls and other features is easy with simple tools. High-density insulation foams and other rigid foams can be carved with craft knives, pottery greenware tools, or polymer clay blades. To create the stone wall shown in these examples, a suitably sized piece of dense foam was cut to size for a stone wall. The foam was trimmed from a thicker sheet of foam, so one side was left with the flat 'factory' finish while the other side was roughly cut with a craft knife. To work out the size you need for a wall, measure a figure or a doorway (for a village scene) and assume a doorway is 6 1/2 to 7 feet tall and a figure is 5 1/2 to 6 feet tall. Use the actual measurement of the figure or the door, divided by the assumed scale height (6 1/2 to 7 feet for a door) If your door measures 5 inches, and should represent something 7 feet (84 inches) high, your scale will be 1 inch = 84/5 or one inch of your model represents roughly 17 inches if the scene was full size. Use these measurements to decide how tall your wall should be, as well as a rough estimate of how many layers of stones there would be in a wall the height you want to build. Do you want rough-carved blocks, exactly square blocks, rough-edged dry stone walls, walls made from river rounded cobbles? Look at photographs for styles of stone walls, or if you are working with existing commercial pieces, choose a style of stone from a piece in your collection. Use a pencil to mark out rough layers of stone on your wall. If you are making block walls, mark out the individual blocks with a pencil or craft knife. Cut the block lines at a very slight angle so you will have more than a knife slit separating them. If you are making rough stone walls, use a knife to carve out rough stone shapes, based on the style of stone you want to represent, roughly following your layer lines to make sure your stones are not oversized for the scale of your wall. Cobbles will be rounded on all edges; dry stone walls will have all shapes and sizes. For walls which are not held together by mortar, make strong separations between the cuts for the stones as shown in the photo on this page. Dry stone walls can have some deep crevices between stones. When you have marked out the outline of your stones, use your knife to carve into individual stones if you need them to have rounded or split surfaces. If you don't carve the surface, your wall will look flat, and you will need to build up layers of coating to shape your stones. When coloring your faux stones or walls, you should work with a simple palette of colors chosen to match your scene. You will need to decide on the characteristics of rock found in the area (check actual photos of stone walls) or match the stone to the colors you choose for soil (worn stone is the basis for many soils). If you are working with existing miniature pieces (village buildings for example), you should tone your stone to match that of the village pieces. Department 56's Little Town of Bethlehem uses resin rocks which have squared, hewn edges in a basic color palate of gray-green, raw umber, and light ochre. Your basic color palette should have three main colors, a dark, a mid-tone, and a lighter tone. They can be the same color (dark grey, mid-grey, light grey) or they can be a range of colors found in the stone in a particular area, dark grey or grey-green for the shadows, rust brown or raw umber for the iron stained stones, and pale grey, cream or ochre for the lighter or worn areas. In addition to the three main colors, you should also have a highlight color. This might be a raw umber to add iron staining, a very pale cream color to resemble sandstone or light quartz, or a green color to resemble lichens or moss growing on stone. For the simplest color schemes for stone, use some flat black acrylic mixed into gesso to make a dark gray for the crevices in dry stone walls. Don't mix the color in completely, as the variation of the color mix in the paint gives some depth to the final effect. Paint this coating into the wall cracks first, (see the samples for the styrofoam wall) then add white to some of this mix to make a mid-grey which goes on the faces of the stones, and add white, or beige to the mid-grey to make a highlight color which is dry brushed, or spattered on the stones to add some texture and break up the other colors. You can spatter or dry brush the dark and mid-tone colors on top of the lighter color in some places to break up areas which are too flat. Using the dark gray base first mixed as the main color, and adding additional colors to this base color to lighten and adjust it, keeps the colors in the same tonal range and is quite effective. When the main colors are dry, and the stone texture and color is right, use a highlighting color to give some interest to some areas of the stones, but not all. You can use bright green or orange to resemble lichens or moss, or dry brush or spatter on a bit of light beige to give some stones more highlights. You can simplify the process of making model faux stone walls by using artist and stagecraft modeling techniques rather than using products from the hardware store. Freestanding stone wall sections made of insulation foam are considerably strengthened by using a coating. The side of the wall on the right in the photo has been coated with artist's gesso applied with a stiff brush to give a sandstone effect. The section in the center shows the uncoated foam, while the section on the left has been coated with Rosco Foamcoat, an acrylic based gesso which is much thicker than the regular artist's brand. The Foamcoat creates a very dense but flexible coating, which stands up well to knocks and movement. The artist's gesso isn't as strong a coating, but it adheres well to the foam, doesn't flake or crack, and allows very fine details to show through. For very rigid coatings, possibly suited to use outdoors, you can use unsanded grout, mixed with some acrylic extender to keep it more flexible and help it adhere to the foam base. Unsanded grout allows you to create the texture you want with a brush or artist's knife. Sanded grout is also useful, but the size of sand used may not suit some scales. Foam boards can be difficult to glue. You cannot use glues which contain a solvent base as they can dissolve the foam. PVA (white) glue can be used to glue foam to a strengthening back support (wood, cardboard or book board as those materials allow air through to dry the glue. PVA glue will not dry if you attempt to use it to glue two layers of dense foam or styrofoam together. As florist's foam allows the passage of air, it can be usually be glued with PVA glues. To glue foam layers together to build up thicker layers (for mountains or Christmas village scenes) use low-temperature hot melt glue (applied with a glue gun), after testing to make sure the temperature of the glue does not melt your foam. An alternative to hot melt glue for foam boards are some artist's contact cement (without solvents) or special glues designed for styrofoam. These include UHU POR glue, Styro Glue (3M) and some craft glues for styrofoam. Liquid nails contractors glue designed for high-density insulation foam application can be used to hold layers of high-density insulation foam together. When gluing corners or other areas where foam may be subject to stress (rock outcroppings, stone arches) use small sections of wooden dowels or kitchen skewers inserted in the ends of the boards to help strengthen the join. If possible hold the dowels in the foam with glue and also run glue along the board across the width of the joint to hold the boards together. Just as with other foams, when making faux stone walls from styrofoam beadboard sheets or recycled packaging materials, first cut and assemble the pieces for your project, according to the scale and design you need. When the glue (if used) has dried, mark out lines across the wall using a ruler and pencil, to set the approximate layers for the stones. The lines can be curved or straight but should be sized to make stones suitable to the scale you want for your project. You can use a pencil or a knife to scribe the general layer lines for your faux stone wall. The pencil will just pull away the styrofoam beads for rough seams between the stones, if you want a neat line for dressed stone block walls, use a craft knife to mark the lines. With the main wall lines scribed, use the pencil or the knife to draw semi-vertical lines between the layer lines to create the outlines of your stones. This is a messy process when using styrofoam beadboard as the beads go everywhere! Make sure you also roughen any straight edges of your wall if you want a rough or dry stone wall, instead of a linear dressed stone wall of blocks. Finally, carve some dents into the surface of your individual stones, or cut small sections away with a craft knife to make them less flat on the surface. This is not necessary for dressed (block) stone walls. Make sure you carve stones on all sides of your wall or building, most dry stone walls will have a capping layer one or two stones across on the top of the wall. Note These same techniques can be used to make square stucco walls with some exposed stone beneath in broken areas, just leave the foam board surface flat in the stucco areas, and create areas of exposed stone by outlining stones on corners, or areas close to openings where a stucco coating might have worn away. Make sure you have decided on an appropriate coating and three colors of "stone" plus a highlight color for your stone wall. (see step 4 and 5). Start with the darkest layer of your stone. This will set the shadows for the crevices between the stones and disguise the shape of the beadboard beads. Use a fairly heavy layer of foam coat, gesso or grout, mixed to your darkest color, and apply with a stiff brush (or a palette knife for grout) to the entire wall, on all sides, including the bottom of the wall to help seal and protect it. This may take one or two coats (especially if you are using gesso). When you are finished the entire wall should be covered in your darkest color, and no white areas should show through. Allow the coating to dry. When the first coat is dry, apply a second layer to any areas where you can see strong outlines of individual beads or seams in your foam. You won't be applying much more color between the stones, so the bead shapes need to be well disguised with your darkest color in these areas. Allow this second coat (if needed) to dry. Mix some white acrylic paint into your previous color or mix up your second, mid ground color, and dry brush or dab this color onto the top surfaces of the stones. Try to leave some of the darker colors underneath showing. If you want stones that resemble granite or quartz-based stones, touch your loaded paintbrush to a piece of waste newspaper or paper towel to remove excess paint, then lightly touch the ends of the brush to the surface of your stones to leave small spotted or blotched paint sections. If you want striated stones that resemble shale or sandstone, use a stiff brush to spread your compound in one direction across the top surface of your stones, leaving strong lines of colored compound behind. Don't worry if you get too much color in an area (see the section of wall on the right in the photo) You can always go back over the section with another coat of some darker paint to break up large areas where you applied to much paint. Set the wall aside to dry with its second coat of finish. The finish should be building up in layers on the front edges of the stones, adding some more texture and depth to the shapes you originally carved. To finish adding depth to your faux stone walls, dry brush a third layer of colored compound over your two previous layers. If you have been using a dry brush (a brush first loaded with paint that you press into a paper to remove the paint from the tips of the brush) to drag across the stones, add the lightest color to some stones using the same technique. If you were using small blotches of paint, continue using that technique. Experiment to see what works best for you. Compare your stone finish to photos of actual stone walls if you can. The lightest color should be only on the outermost surfaces of the stones, the areas which would be most exposed to light. In some scales, a spatter technique works well to add detail to faux stone. You can use a stiff brush or an old toothbrush and run a palette knife across the bristles away from the surface you want to spatter, to produce speckles of color on the stone. Spattering can be done with any of your three colors, once you have the lightest color in place. Spattering will help balance color areas which appear too light or too dark. In the photo above, three degrees of gray Foamcoat have been added to the styrofoam wall section. On this wall, more dry brushing of various colors is needed to balance out the wall colors before the final highlight layer is added. The highlight layer for this wall will be a green or orange tinge to resemble moss and break up the layers of gray. At this stage, you can still go in a completely different color direction. Compare the photo of this wall with three gray layers to the version of it on the first page of this tutorial. To use this wall close to existing commercial models made of resin, raw umber, and ochre colors were dry brushed over the grays to make a closer color blend to the commercial stones on the well. It is never too late to adjust your color range! This low free-standing stone wall for a nativity scene was made using dense foam insulation and various coatings. The dense foam coat coating made stones with very similar surface texture to the ones in the commercial well it is intended to fit beside in the scene. The dense coating, however, filled the spaces between the stones, making the wall look too formally constructed, possibly mortared. For the final scene, sections of the wall will be made using the same techniques and colors, but adapting the process by thinning the dark coat intended for the cracks between the stones. In the sample above, the deep cracks look more natural. A heavier coat of material will be applied to the top surfaces of the stones to make them have the same texture as the commercial (Department 56) resin models. If you have models you need to adapt to fit with other pieces, try a sample section like the one shown here to work out the best way to use your available materials. When you have the sample the way you like it, it is easy to create a range of other pieces to match. The stone technique used here can now be used on thin slices of foam glued to simple bookboard buildings, and more stone walls and outbuildings can be added to the scene keeping a similar look to the commercial pieces. Although your first attempt may not be exactly what you want, keep experimenting to find a method that works for you. Lizard Landscapes shows steps in making all kinds of foam landscapes from a castle to a sandstone desert scene. The techniques are the same whether you are making miniature terrains, railroads, dollhouses, or terrariums for your lizard!